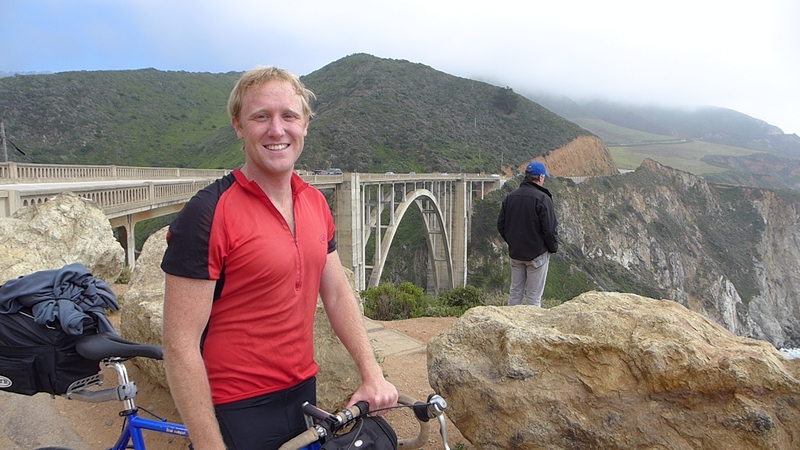 My son Jack is living in San Diego, and he wanted to do a bicycling trip down the California coast, but without him taking more than one day off work. Together we came up with a Saturday though Monday plan. We would both fly to San Jose airport. I arrived San Jose late Friday night and stayed in a motel. Early Saturday morning, I picked Jack at the San Jose airport, and we drove a one way rental car sixty miles south to the small Monterey airport. We left the car there, pulled two bicycles out of the back, and biked off into the California morning. Our destination was San Luis Obispo 142 miles to the south; we would need to arrive there by 1:30 PM Monday to catch the southbound Amtrak to Los Angeles and San Diego. 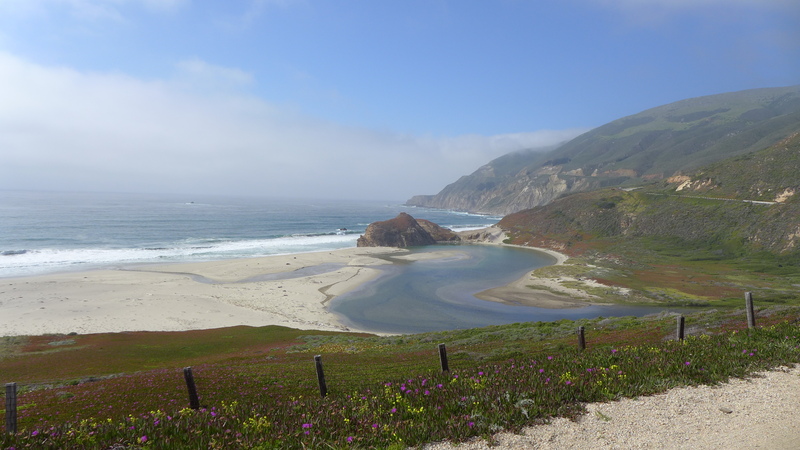 California Highway One south of Monterey and Carmel is a coastal road of dreams. Parts of it are remarkably isolated (in much of the area cell phones do not work, very few stores and restaurants) especially for a region that is within driving distance of two huge metropolises. 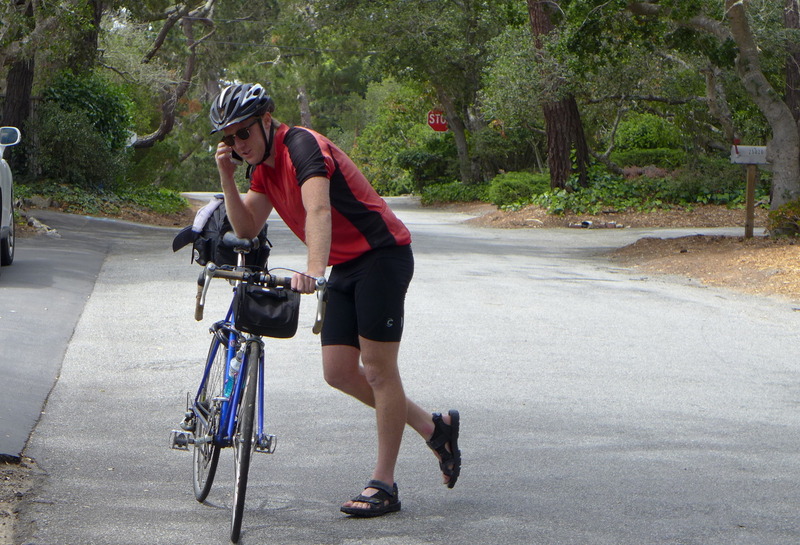 Just as we were starting, Jack stopped to take a work phone call. Carmel was our last stop before we heading into the coastal wilds. Carmel is a cute and very rich town, apparently for people who do not have to work, since it is not near any employment centers. Appropriately, we had a nice brunch before taking off down the highway. The coastal highway dips up and over cliffs, with the occasional bridge over a ravine. The cold ocean generates fog, and the blue sky pokes through only on occasion. The temperature moves back and forth with the sky, from warm sun to damp chill. 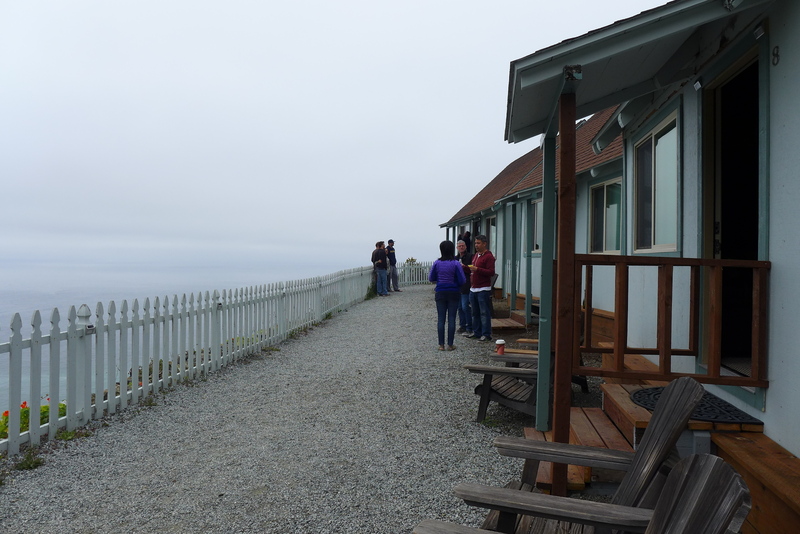 There is so little development on this coast that finding a place to stay is a challenge. 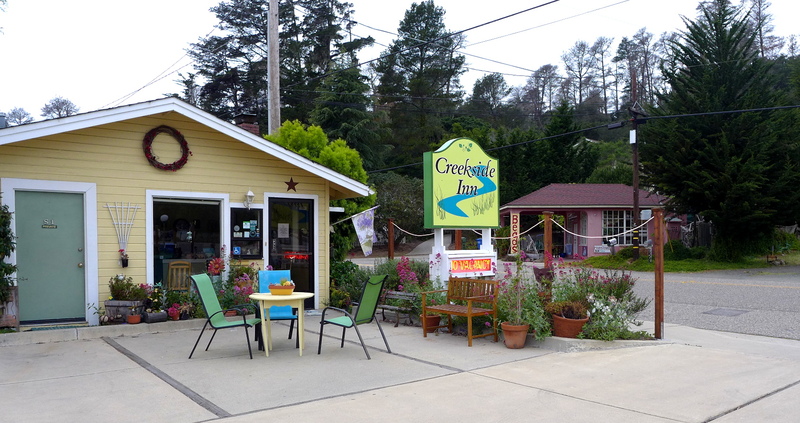 Sixty miles south of Monterey we ended up at the one motel in the “town” of Lucia, south of Big Sur. Once you got over the very high price, and the fact the restaurant had thirty dollar entrees, it was actually a quite informal and friendly place. Little 1930’s cabins overlooking the ocean. The next morning we headed out into the cold fog. 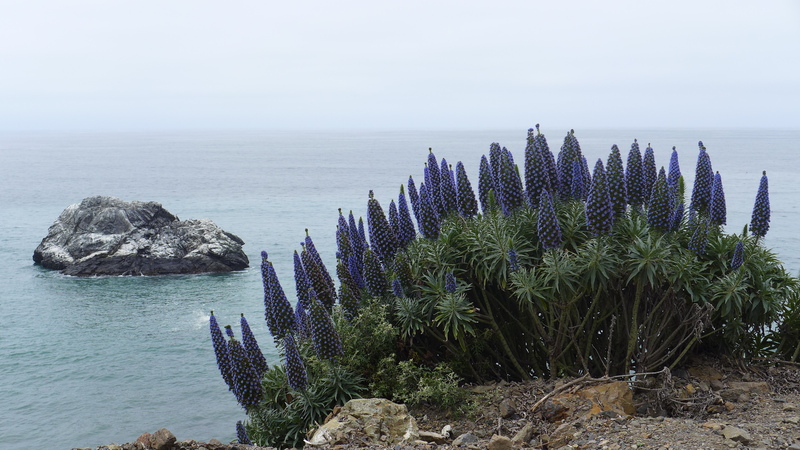 There was no major town until our day’s destination of Cambria, fifty miles south. The scenery the entire day was lovely. 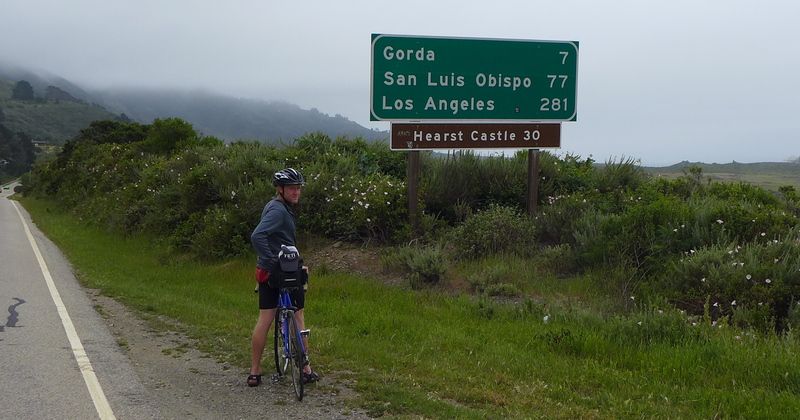 We passed the Hearst Castle, seeing it up high on a ridge several miles away. We did not take on that uphill climb to actually see it up close. 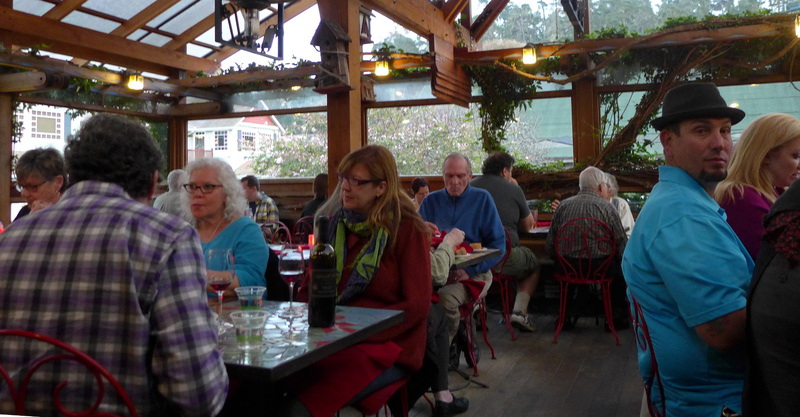 At 12:30 PM on a Sunday we stumbled into Ragged Point; a restaurant by itself on the highway, with an outdoor space full of people with barbecue, hamburgers, beer, and a live band. You could not ask for more. Down the coast, the mountains move further from the sea, and the road flattens out. 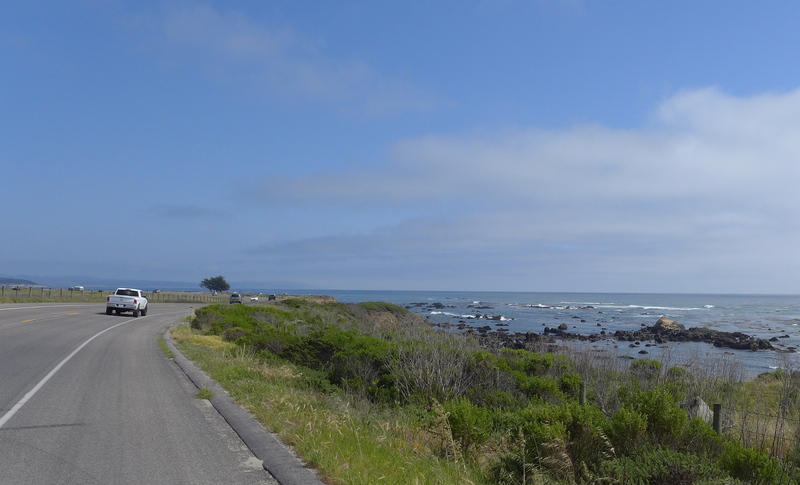 That afternoon we tiredly rode into Cambria; the kind of place that I thought California no longer had; small town, great food, nice weather, no apparent traffic or pretentiousness. From Yelp we found what is clearly The Best Restaurant in Town; Robin’s. It is the kind of place that would have been in the movie Sideways. Gourmet food and local wine, but casual. Jack had never tasted dessert wine before, so we shared a $12.00 glass of red dessert wine grown and made in Paso Robles, about thirty miles away. The motel was a similar vibe, less than a third of the price from the place the night before, but friendly, quiet, and clean. We had only thirty-five miles left the next day to San Luis Obispo, home of Cal Poly and another place that seems like The Way California Used to Be, in a good way. Extra credit for anyone who knows the significance of this street. 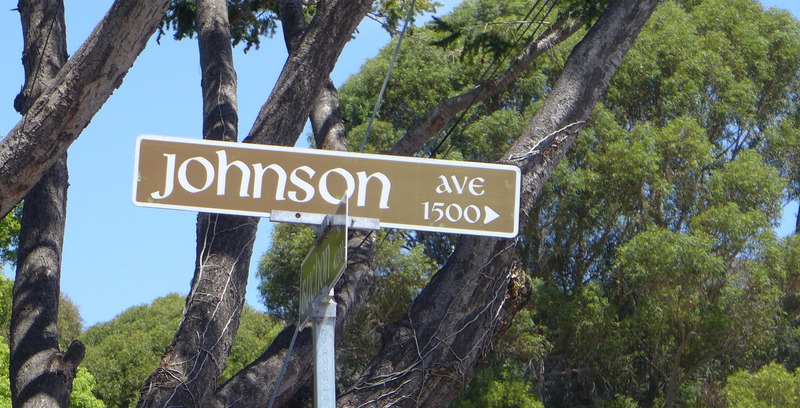 Hint: what song by what band mentions this street? 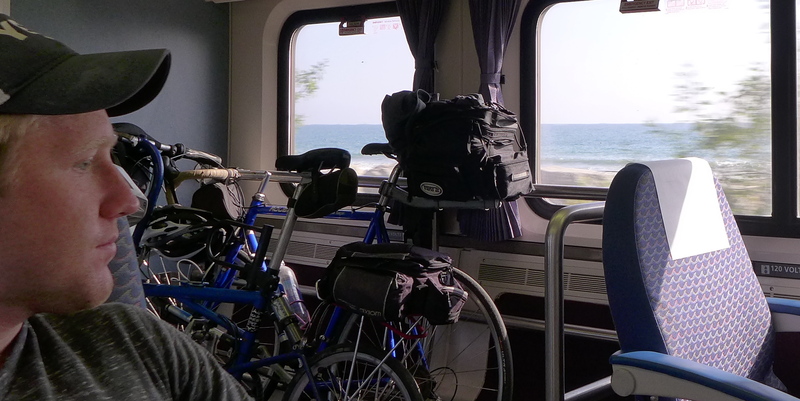 We got ourselves and the bikes on Amtrak, no problem. Jack got back to San Diego at ten something that night, but I got off in downtown L.A. Much of the train ride went right on the Pacific Ocean.